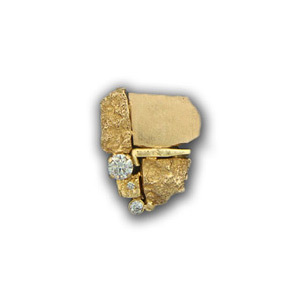 Handmade one of a kind abstract 14K yellow gold and diamond ring, made from rock castings of the Franklin Mountains. Total diamond weight approximately .90 ct. FRR.90 – Call for pricing. Worn on the red carpet at the Emmy Awards 2014. 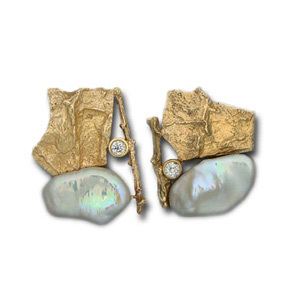 Handmade gold one of a kind abstract 14K yellow gold, diamond and cultured pearl earrings cast from natural rocks and vegetation in the desert. Total diamond weight approximately .80 ct. FRE.80 – Call for pricing. 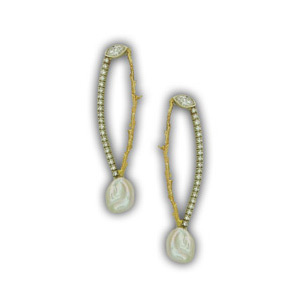 Handmade one of a kind 14K white & yellow gold, Forevermark diamonds, and cultured pearl earrings made from a gold casting of natural plants. Total diamond weight approximately 1.60 ct. FMFR 1.60 – Call for pricing.